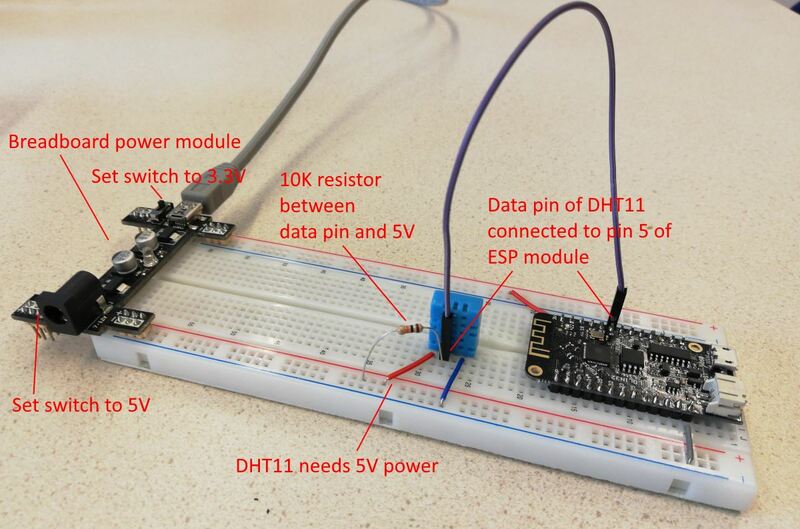 This tutorial demonstrates how to build a simple sensor and publish its values online (on a web server) using an ESP32 module. We will build an Arduino sketch which will read the sensor values, connect to WiFi, connect to a website and publish the values on the website. The published values can then be used to view them online (view them on a web page) or in an App (this is a separate tutorial). 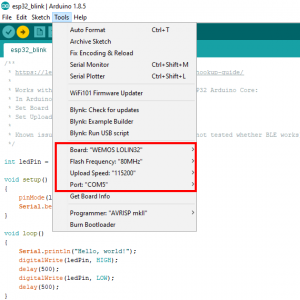 This tutorial assumes you already have basic knowledge on Arduino and building simple circuits. The temperature sensor’s Vcc and GND pins are connected to the 5V + GND power lines on the breadboard. There is a 10K resistor between the data pin of the temperature sensor and the 5V power line. Start the Arduino IDE. Choose File > Preferences. At “Additional Boards Managers URLs” enter "https://dl.espressif.com/dl/package_esp32_index.json" (without the quotes). Now choose Tools > Boards > Boards Manager. Enter “esp” in the search field. Click on “esp32 by Espressif Systems” and click the Install button. To be able to use the DHT sensor, we must install a library. For this example we use an ESP-version of the DHT library “DHTesp”. You can add it into the Arduino IDE via Sketch > Include Library > Manage Libraries, search for “DHT”, pick “DHT sensor library for ESPx”. Or do a manual install: goto github.com/beegee-tokyo/DHTesp to download this library (click the “Clone or download” button and choose “Download ZIP”). Extract the zip-file to Documents\Arduino\libraries and rename the folder to “DHTesp”. Connect a mini USB cable to the power module on the breadboard and connect it to your computer. Connect a micro USB cable to the ESP module and connect it to your computer. Download the first example "DHTesp_basic_example.ino" and open it in the Arduino IDE. Download the complete example "esp32_web_client_dht11_v2.ino" (and study it). 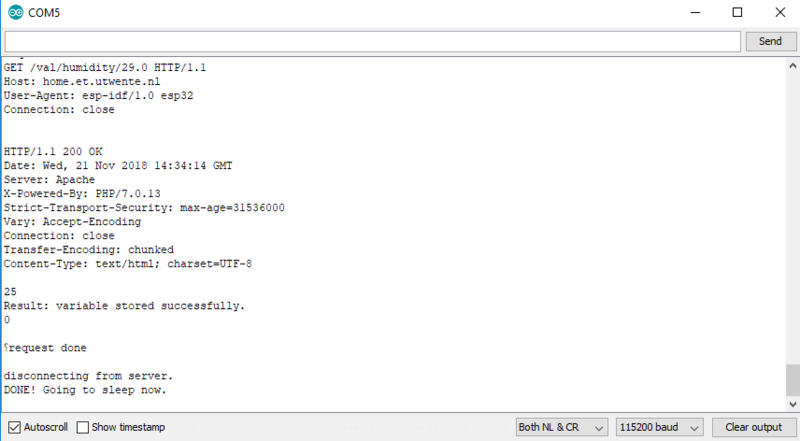 It uses my web server home.et.utwente.nl to store values. Find the lines with the settings for the WiFi connection (variables ssid and password) and adjust them to reflect your WiFi settings. If you attend one of my workshops, the preset values might work. If you want to upload values to a different web server, adjust the variable server and test_root_ca (this contains the certificate, more on this below). And check the request settings in the function doRequest(). The request is made like this: GET /val/variable/value where variable is the name of the variable to use for the value. And change the "temp" and "humidity" (red underlined) to something unique, eg. "temp953276" and "humidity17897". Now, Upload it and start the Serial Monitor when it is uploaded. Part 2 of this example: Use App Inventor to build an App that can read the online values for a connected sensor. If you do not want to use my webservice but for example the Blynk cloud service, check out this post. You can also connect to the ThingSpeak service to log and analyse data from sensors. In the example above, the certificate will be written to the file “cert.output”. If there are multiple certificates, get the one labelled “Root CA”.